I have three children ages 5, 6 and 7 currently in booster seats. 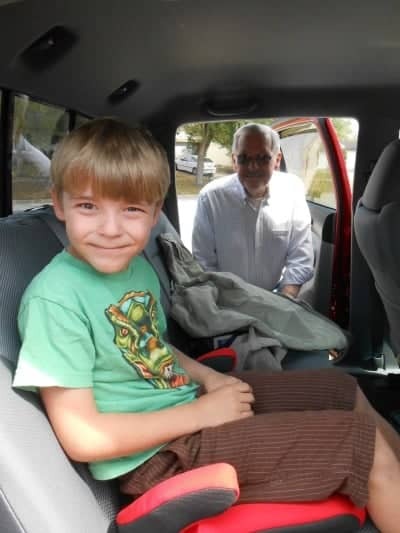 My father-in-law stays with us six weeks out of the year and has always wanted to take my seven year old son out to breakfast or to the Farmer’s Market with him but I have had to decline because of the lack of booster seat issue. 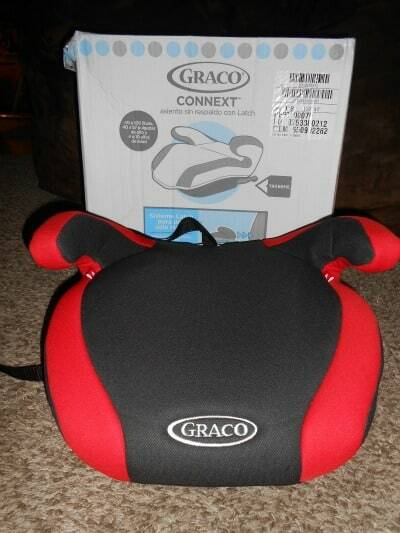 Today, my seven year old son proudly went out on the town with his Papa because we were able to quickly install the CONNEXT Backless Booster Seat with Latch System by Graco® in his truck. Designed for children ages 4 to 10 (40 to 100 lbs) and 40” to 57” tall this rear-adjust latch system secures the booster seat to the vehicle seat. The booster seat was very easy to attach securely with the latch system and the booster seat ultimately stays secure so the child or parent can easily buckle the seat belt. I have had several neighbors laugh that my children are still in booster seats (Graco 5 point harness boosters) in our main vehicles and we do not allow them to ride in any vehicle without a booster seat. I personally believe that my children’s safety comes first and I will keep them in booster seats until they no longer meet the specifications. You are invited to visit the Graco® Baby website to browse the entire selection of high quality car seats, booster seats and products for baby. Through 3/24 Graco® Baby is featuring the Bumps in Action Facebook contest where one lucky grand prize winner will win a Graco FastAction Fold Jogger Click Connect Travel System, a $5,000 scholarship for baby, a one year gym membership and a consultation with a personal trainer. 10 runners up winners will win a FastAction Fold Jogger Click Connect stroller! For your chance to win you can visit the Graco Baby Facebook page and share a picture of you and baby or you and your baby bump in action. This is great . like the colors of them and they are so easy to install and take out . But most of all I like the price. You could easily buy 2 one for the grandparents car also. Always good to have your children save when traveling in a car. I am going to be looking for a booster for my 4 year old son as he is starting to grow out of his car seat. he is big and tall for his age. Thanks for the great idea and review!! Thank you for this review it is hard to know which products to buy sometimes and this information is great to know as my 5 year is transition into a booster soon. This does look simple to use! I’m a stickler for height/weight recommendations on boosters, so it’s nice to know there’s a product that can ensure safety even when grandma’s visiting! Great review. My nephew wants out of his booster seat. He says it’s a baby seat. But he isn’t big enough to go without some type of booster seat. I will have to tell my sister about this one. He would like it because it’s not a full booster seat. I’m glad your son got to go. How exciting! It’s great that they make a booster seat that is so versatile and easy to use. I am a big fan of these booster seats. We have them in all our vehicles for our girls. My friend is looking for a booster seat and I will share this review with her! Thanks for sharing! This looks like a good choice and vey affordable when I need to consider a booster seat. Does this have a belt guide too? Is it a lower profile booster? What are the measurements? Great review! I really like this booster seat. My only issue with the review is that is looks like your son doesn’t actually fit correctly in that car. This seat, and all backless boosters, require head support to protect the neck from whiplash. If the tip of his ears are going over the back of the seat of the car then he needs a high back to protect his head. Double check the manual though, some high backs require vehical support. If you have another car with headrests it can safely be used in that car.